THEFT: A 14-foot trailer with new tires and a new wood floor was stolen sometime between 7-9 p.m. on March 14 on the 900 block of South Main Street. A male subject reported four tires and rims were stolen from his property at 4:30 p.m. on March 16 on the 1000 block of Jill Court. A caller’s bicycle was stolen from his property sometime overnight between March 15-16 on the 200 block of East High Street. BURGLARY: On March 15, a homeowner reported a home broken into sometime over the last four days on the 300 block of Riverside Drive. Tools were reported stolen. The resident reported on March 16 that a home owned by him was broken into for the second night in a row. Tools were taken. CHILD ENDANGERING: An allegation of abuse was made at 1:40 p.m. on March 15. The location was redacted. Possible child abuse involving a five-year-old boy was reported at 11:15 p.m. on March 15. The location was redacted. The investigation is pending. DISTURBANCE: A male subject was trespassed from property at 4:50 p.m. on March 15 on the 300 block of South Downing Street. CRIMINAL DAMAGE: An officer responded to a call referencing a stolen vehicle at 9:40 p.m. on March 15 on the 1000 block of Broadway Street. The vehicle was found to be a civil matter. The subject also stated her front door was kicked in. The suspect was charged. Michelle R. Uzzell, 43, of Piqua, was charged with second-degree misdemeanor criminal damaging in connection with this incident. A male reported his vehicle was egged overnight between March 15-16 on the 700 block of West Greene Street. SUSPICIOUS: There was a report of possible shots fired at 10 p.m. on March 15 on the 400 block of Adams Street. Officers checked the area and were unable to locate anything indicating shots fired. There was a report of subjects inside an apartment that they had been evicted from at approximately 10 p.m. on March 17 on the 500 block of North Sunset Drive. Subjects were located in a vehicle leaving the area. One female was arrested on a warrant and charged with possession of methamphetamine. 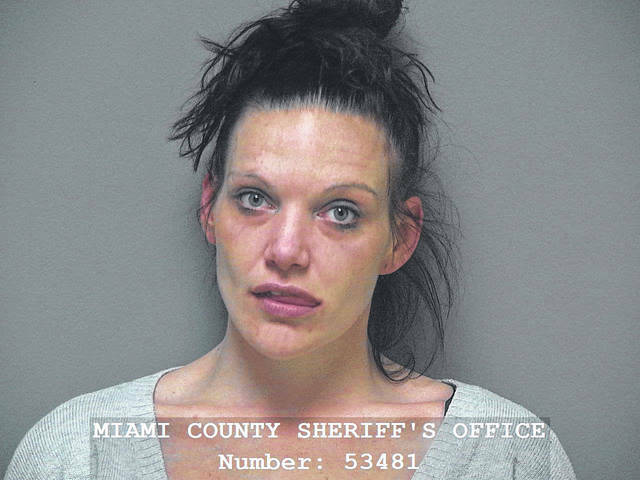 Crystal A. Donnelly, 33, was picked up on charges of fifth-degree felony drug possession, fifth-degree felony possession of cocaine, first-degree misdemeanor theft, and first-degree misdemeanor possession of a drug abuse instrument. Police were dispatched to a burglary complaint at 2:50 p.m. on March 16 on the 400 block of Adams Street. Dispatch advised a neighbor called and said someone was breaking into his neighbor’s residence. The subject breaking in was located, and it was discovered he was a resident at the address. There was a report of shots being fired somewhere in the apartment building at 6:05 p.m. on March 16 at the Piqua Senior Apartments on College Street. It was discovered that one resident was hammering nails in his apartment. DRUG OVERDOSE: A male overdosed and was revived by squad members with Narcan at 1:50 a.m. on March 16 on the 1000 block of West High Street. The male was transported to UVMC by squad. TRAFFIC STOP: Following a traffic stop at 6 a.m. on March 16 in the area of Jean Street and North Sunset Drive, Tyler M. Doll, 24, of Troy, was charged with first-degree misdemeanor OVI. ACCIDENT: There was a traffic accident with no injuries at 12:25 p.m. on March 16 on the 500 block of Gordon Street. A hit skip accident was reported at 1:20 p.m. on March 16 on the 400 block of Summit Street. DISORDERLY CONDUCT: There was an assist squad call for a female with difficulty breathing at approximately 7 p.m. on March 16 at Lucky’s bar on Main Street. A female was found to be intoxicated and unable to care for herself. A female was cited for disorderly conduct and transported to the hospital by squad. Amber R. Rodeffer, 28, of Troy, of was cited for minor misdemeanor disorderly conduct in connection with this incident. UNRULY JUVENILE: Two juveniles were found exiting an abandoned building at approximately 7 p.m. on March 16 on the 600 block of Broadway Street. The juveniles were warned for trespassing and turned over to their parents. TELECOMMUNICATIONS HARASSMENT: There was a telecommunications harassment complaint at the Red Roof Inn and Suites at approximately 11:10 a.m. on March 17. A victim stated a subject was unhappy with the hotel and keeps calling. A subject was warned for telecommunications harassment.